The Heart and Soul fabric collection is near and dear to my heart. My youngest child (and only daughter) turned 12 the day it came out. It seems so fitting since she was one of my inspiration pieces for the line. I set out to make Heart and Soul and the panels that go along with it, something uplifting for her, something that she could read and feel loved and remember what's really important in life. I knew that if it would be inspiring for her, it would be for other people, too. 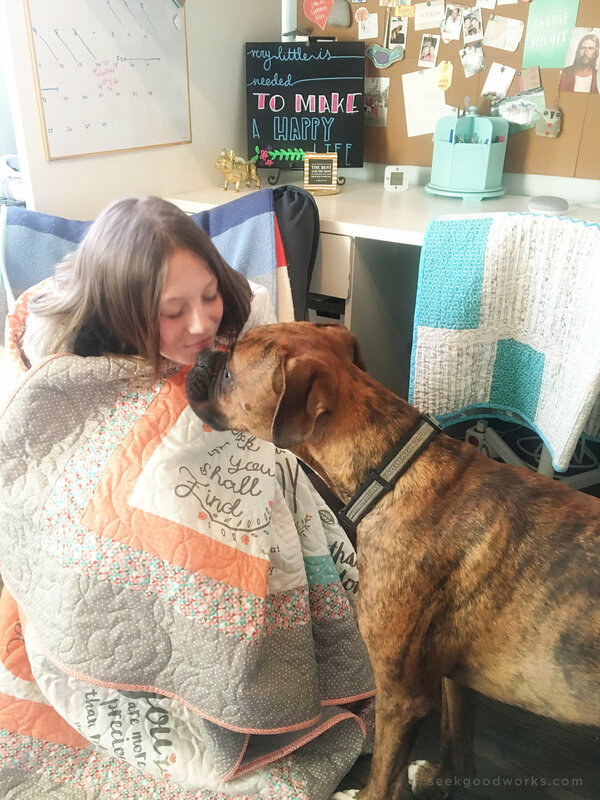 As I write this post, Kate is snuggled up in it reading "Where the Red Fern Grows" and it makes my heart want to burst. Also, because she is almost at the end of the story and she's going to need some comfort soon. I hope you find inspiration and comfort in my Heart and Soul Collection. I'd like to share some beautiful projects made from some amazingly talented women. Amy Smart at Diary of a Quilter pieced this beautiful quilt. We look forward to her pattern coming out soon! Amy at Amaroonie Designs made all of these wonderful projects. Such talent and hard work! Thanks to these amazing and talented women for sharing their gifts with us and showing off the Heart and Soul Fabric Collection.